The HSUS and their Vision for Wild Horse Management in the U.S. Here you will find articles that I have written and equine related resources that are of interest to me. Hopefully, you will feel the same. Equine Rescue and Rehabilitation Ranch (Triple R), Inc.
We have started a new page on our website featuring our animals and friends at Cypress Run Farm. I think the YouTube clip (below) will decide the question of Horse Slaughter for most people. Once the animals are out of our care and go this way, they all get the same treatment, DON'T KID YOURSELF! A bullet in the head in a familiar pasture or stall is an infinitely more humane solution than this, (assuming horse owners who opt for slaughter cannot afford Euthanasia). I was naive in my assumption that animals would be treated at least fair. Even if only 1% of slaughter bound animals receive this kind of treatment before they are put to death, its 100% too many!! I am not posting this kind of movie lightly on my webpage, but this is a gruesome reality hiding inside those neatly packed hunks of meat in the supermarket freezer we consumers are paying top prices for. I realize that most people are meat eaters. What I hope to accomplish is for people to no longer support this kind of legalized cruelty, mechanized industry, but find alternative resources for their food. As for horse meat from our ex racehorses, yearlings, old ones, injured ones, our Mustangs... NO WAY! 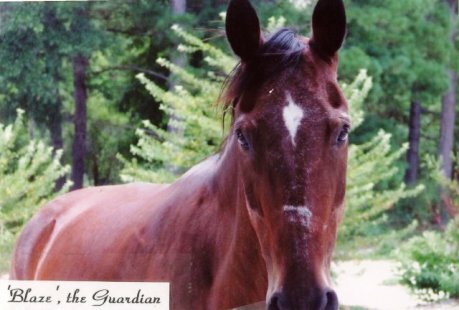 We at Cypress Run have always taken in unwanted horses as much as we are able to. With great sadness we learned that the Bureau of Land Management (BLM) is again out to reduce the herds of our last wild Mustangs into non-existence. Fact: In the Western States there are eight (8) head of cattle for each wild horse or burro grazing on land originally set aside for the Mustangs. Yet, the BLM blame the horses not the cows for overgrazing problems and want to remove the Mustangs to holding areas. There are currently 36,000 plus Mustangs and wild burros in feedlots, fed and managed at taxpayers expense, while privately owned cattle is grazed for pennies per head per month on their home, mostly public or federal land. So, those enigmatic horses ,without whom there would have been no USA, are systematically and cruelly reduced to insignificance in the wild. There is little chance of recovery since there is no longer sufficient genetic variety in the bands remaining free. The method of capturing those horses with helicopters is callous, cruel animal abuse that would land a private citizen in jail for decades, yet it is ok for Government Agents to do so, all funded by tax dollars. The winners in this tragedy is the cattle industry who get to sell their steaks twice: First by grazing on federal lands while the taxpayers feed the rightful inhabitants in feedlots; and second in your local grocery store. We urge you to join campaigns of established organizations like IDA (In Defense of Animals) ,the Cloud Foundation, the Calico Mustangs Group or HSUS amongst many others, to grant our remaining wild horses their freedom. On the backs of their ancestors the USA was founded. They are Americans, too! The original 'victory' of closing slaughter houses went horribly wrong. People just started packing them in trailers intended for cattle and started to ship them to Canada and Mexico where they would die just as cruelly if they did not die during the transport of exhaustion or from getting trampled. The problem with Euthanasia is that it costs $200 plus disposal per horse ($350 and up if you have to hire a backhoe), so the average backyard horse owner tends to get rid of their horses in auctions or by dumping them. It seems every time people try to change a Law to improve something, somebody finds a way around it and makes the situation worse for the intended benefactor. I personally think that educating the people who currently own horses about the facts of what might happen to the horse they sell or give away 'to a good home with lots of space to run' is going to be the most effective way of saving horses. Since horse slaughter will remain a fact of life, if not in the US then in different countries, maybe somebody should push to change laws that slaughter houses have to use humane killing methods that are specifically designed for equids. The bolts they are using now are designed for cattle (thicker bone, shorter neck). Temple Grandin, PhD. a Professor of Animal Science at Colorado State University and an expert on more humane methods of slaughter addresses this issue in her books and on her website (http://www.grandin.com/). She was hired by slaughterhouses to design access ramps that would keep cattle from panicking, reducing stress (and destroying equipment). Cypress Run Farm likes and strongly recommends Allen Bassin, an Equine Dentist, for your equine needs. Allen Bassin has been an Equine Dentist for about 20 years, he is mobile and has very reasonable fees. He has the equipment to do even difficult teeth, and has been servicing the Racing Barns of South Florida. He is the most able, efficient Dentist we have ever hired to work on our 20 or so horses. Just the other day he pulled one of our 25 year old horse's molars (Chloe). It was done painlessly, and the tooth was out in about 5 minutes. Chloe was standing, mildly sedated with a speculum to keep her mouth open, her head resting on a support, but otherwise unrestrained. She walked out of the stall after the floating and extraction and was normal 20 minutes later. Her teeth now look like those of a much younger horse and, more importantly, allow her to chew without pain once more. We highly recommend Allen's work. He is fast, no nonsense and knows his trade. You can reach Allen Bassin at (850) 774-9189 or via email at: bassin42@hotmail.com . Cypress Run is supporting the Leaping Bunny Campaign. Check the products you buy! Only products with the leaping bunny symbol are truly cruelty free . Animal testing is an outdated, ineffective, ethically questionable (at best) habit of many manufacturers and State Agencies. To work towards a better future for millions of small and large animals who could have been your pets, look for the leaping bunny when you shop. Ask for a free cruelty free shopping guide at Leaping Bunny. 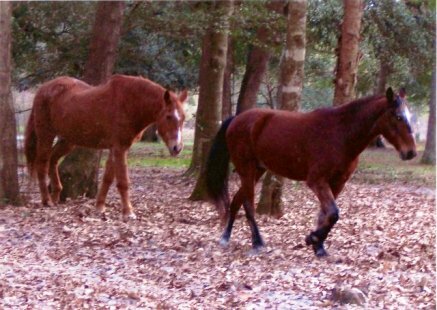 Equine Rescue and Rehabilitation Ranch (Triple R), Inc. is a non-profit organization that provides a program of horse rescue for physically or psychologically abused, neglected, troubled, or abandoned equines in Leon County. They provide rehabilitation, retraining, and placement, where indicated, or retirement within an environment of physical well-being and trust. In support of these efforts Triple R employs and promotes natural horse keeping and training methods. Triple R Inc. seeks to increase beneficial human and equine relationships through animal/human interaction and education. Visit them at: http://equinerr-tlh.webs.com/ (opens in new window).